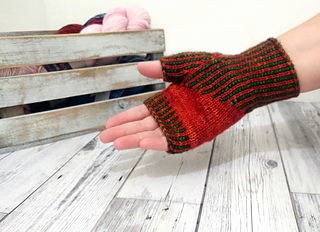 Fits approximately a ladies' Medium to Large (7.5-8" / 19-20.5 cm hand circumference). 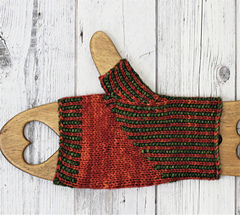 Be sure to keep your floats loose to ensure a proper fit. 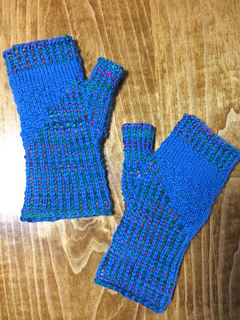 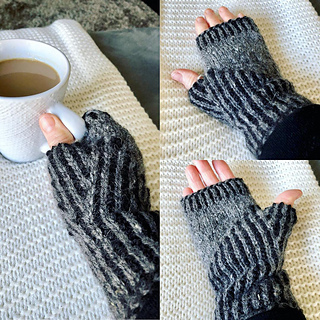 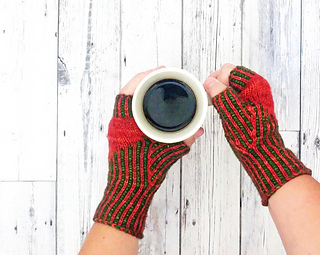 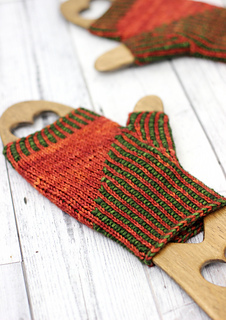 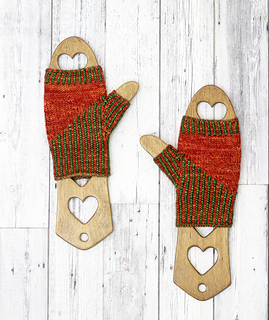 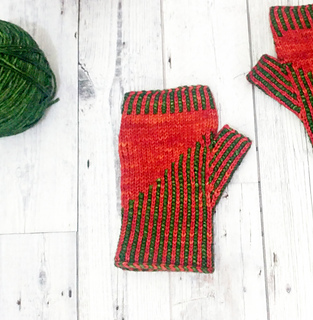 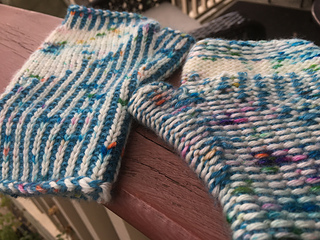 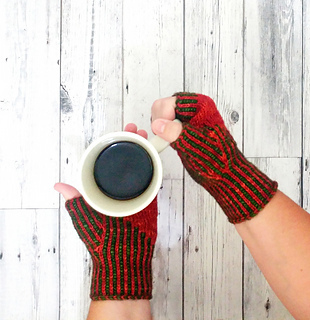 I love the look of corrugated ribbing, and wanted that to be the highlight of these mittens. 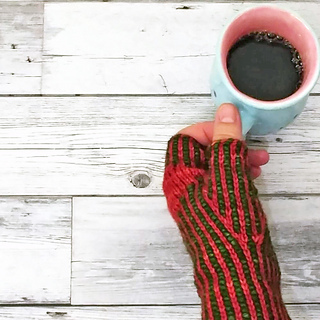 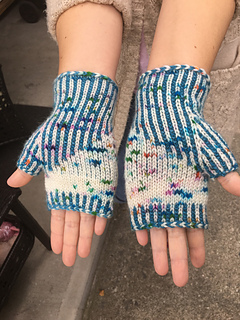 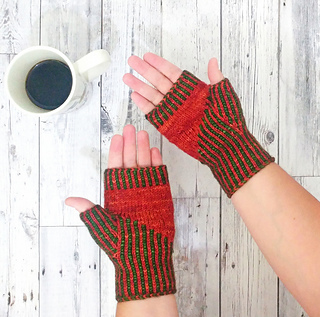 It works great for fingerless mittens because it keeps the mittens fairly tight to your hands while staying stretchy - very helpful when you’re wearing them and you want to type or knit! 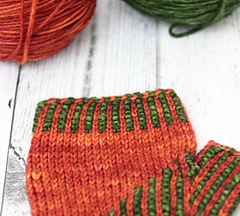 DK weight yarn in two contrasting colours. 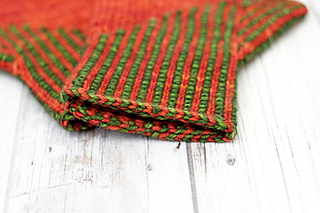 Sample was knit in Colour Adventures Dia Merino DK (DK, 100% superwash merino, 211 meters/231 yards per 100 gram hank), 1 skein in Pumpkin, 1 skein in Olive Grove. 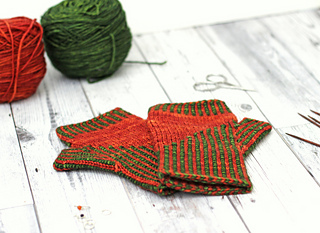 Set of 5 US Size 4 (3.5mm) Double Pointed Needles. 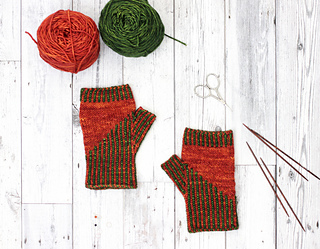 Very short (9”/22cm) sock needles or very long circulars and the magic loop method can be used, but you will need the DPNs for the thumb! 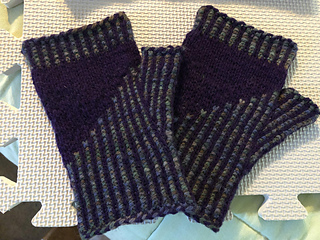 22.5 sts and 29 rounds = 4” (10 cm) in stockinette stitch knit in the round, after light blocking. 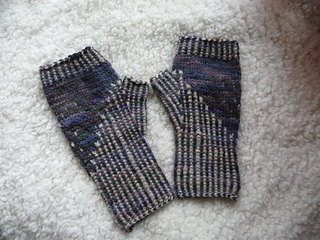 Fits approximately a ladies’ Medium to Large (7.5-8” / 19-20.5 cm hand circumference). 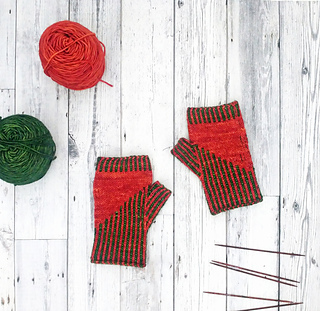 Be sure to keep your floats loose to ensure a proper fit. 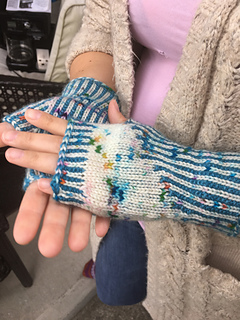 This pattern has been tech edited and test knit for errors and clarity. 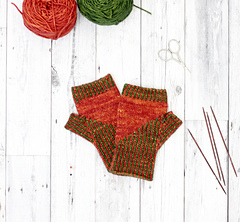 However, if you do run into any trouble, just email Sarah@KnitaBitofWhimsy.com and we’ll get you sorted out!